From the vantage point of the early 21st century, it is difficult to imagine an era before ours when human communications were revolutionized as much as they have been by the internet. The early history of the mails is evidence that there have been revolutionary periods with as much of an impact as the internet before our time. Letters used to be carried by indenpendent agents before the establishment of the modern post office, beginning in the 1760s with most European countries, a service that was extended to European colonies. It is from this period that the first letters with town and city name marks appear. With the advent of the steamboat in the 1830s, mail service volume increased sharply, many cities adopted dated postmarks, and England and France evolved their previous postal agencies throughout their respective empires into an organized and global postal system. Globalization is very old indeed. 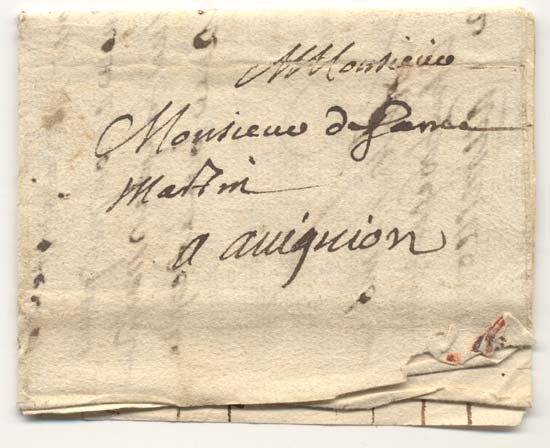 Below is a 1702 French letter to Avignon. As was the custom before the 1760s in Europe and the European colonies, there is no postmark. This letter, although most likely mailed by some sort of a commercial enterprise, is from before the establishment of central government post offices. Below is a letter from the 1840s. While this letter was carried inland, it is an illustrative example of an early dated postmark. 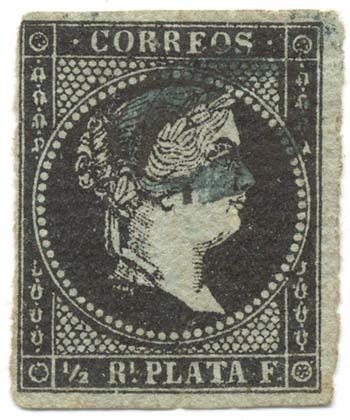 Instead of a stamp, these covers bear the rate to be paid by the person receiving it (12 centimos in this case). 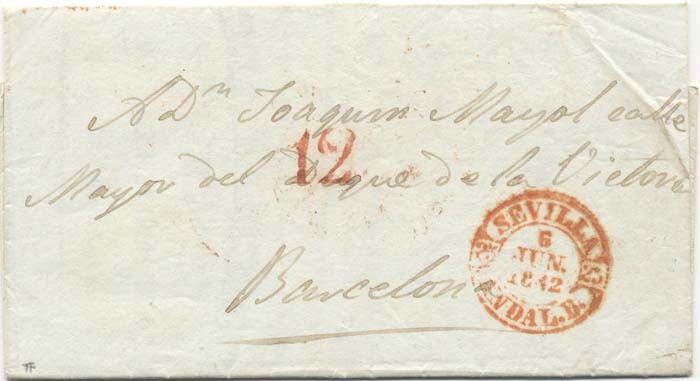 This cover was mailed from Sevilla to Barcelona, in Spain, June 6, 1842. The rate structure of the pre-stamp era was very complicated, lacking in treaties between countries as to how much was to be charged by each postal system for an international mailing. The collection method-payment by the person receiving the letter-was costly for cases when the letter could not be mailed, or the writer made notes on the back to be read by the person receiving the letter, who would then refuse delivery. The advent of the postage stamp, introduced by England in 1840, was as much a force of change as the internet is today. Suddenly, postal rates became better structured, enabling governments to charge considerably less for mail. Because of this rate decrease, and the increasing steamboat traffic, mail volume in Europe, the United States, and the European colonies increased sharply. The anticipated demand for stamps grossly underestimated this volume increase in many countries, and the first issues had to be reprinted many times. Below is a specimen of the first stamp, issued in 1840 by England (now U.K.). 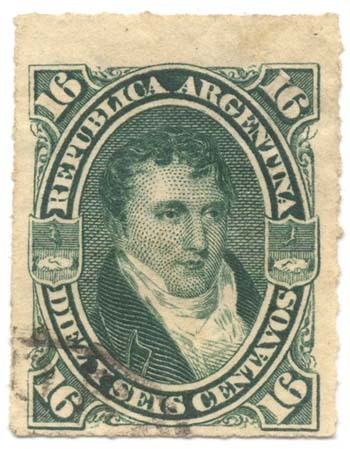 The stamp was printed from 11 plates, some of which were later printed in red brown, which is the color that was adopted in 1841 and used until the mid 1860s. The stamps do not bear a plate number as is the case for the later penny stamps. Stamps from the 1840 and 1850s were printed in hand-made paper and are often handled by many collectors. This penny black has been cancelled with a red Maltese Cross. 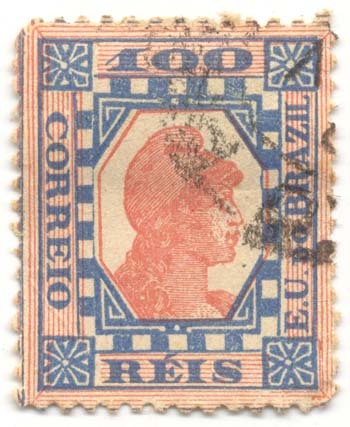 The stamp proved easy to tamper for reuse since the red cancel, if faint, enabled reuse. For this reason, the cancel was changed to black and the stamp to red brown in 1841. 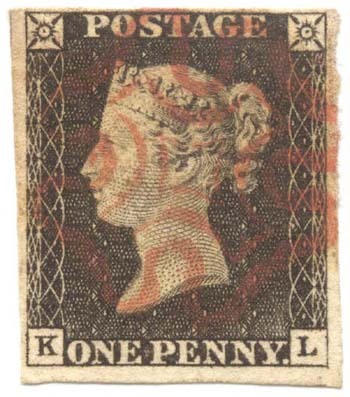 The penny black, along with the two pence blue stamp, was issued May 6, 1840, although there is an instance of postal use before this date. The use of stamps became such an important innovation for England that, within 20 years, most countries had adopted the use of stamps (for example: Brazil in 1843, the United States in 1847, France in 1849, Spain in 1850). The stamp was printed in sheets of 240, with the check letter placed at bottom left of the design referring to the row, and the check letter placed at bottom right of the design referring to the column. A sheet sold for one pound sterling. Below is a Bavaria 3 Kreuzer specimen from the early 1850s. Each town in Bavaria was given a postal code denoted by a three digit number. The Bavaria 3 Kreuzer stamps are not as common as the English penny reds of the 1840s, 50s, and early 60s, yet are still very common by 1850s standards. Below is a Bavaria 3 Kreuzer specimen from the early 1850s. Each town in Bavaria was given a postal code denoted by a three digit number. 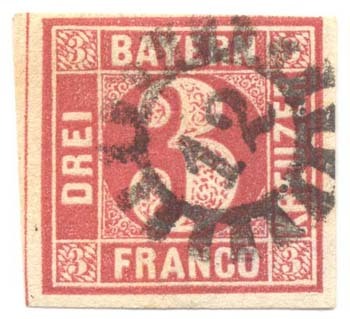 The Bavaria 3 Kreuzer stamps are not as common as the English penny reds of the 1840s, 50s, and early 60s, yet are still very common by 1850s standards. 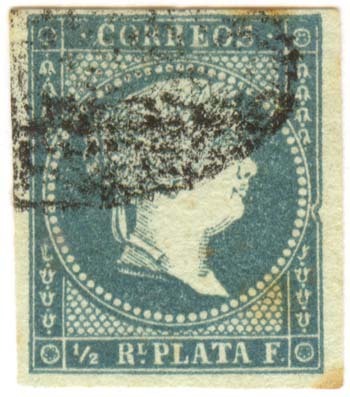 From my selection of 19th century stamps I can offer additional examples: the first issue of the Spanish Antilles, which saw most use in Cuba, and was also used in the Phillipines, Puerto Rico, and the Dominican Republic. The first printing, in early 1855, sold out very quickly, and had to be replaced by a second printing, in late 1855. This is the reason why there are two separate runs of each value for the 1855 issue. Below is an example from the first printing, on bluish paper, and an example from the second printing, on white paper. The use of imperforate stamps was soon superseded by the use of perforated stamps. Perforation enabled postal clerks to spend less time separating stamps for sale. Several attempts were made well into the early 20th century to attain the most effective method of perforation. In addition to the modern round holes perforations, rouletting was used by several countries. Below is an example from 1880s Argentina. Various means were used to discourage postal forgeries, including high quality designs, secret marks, and the use of watermarked paper. 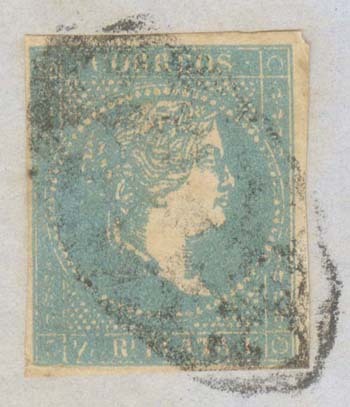 Unwatermarked issues tend to be more prone to forging to defraud the post office, as is the case with the postal forgery from Cuba of the 1857 unwatermarked issue, shown below. This example is from a full cover! In a further step to discourage postal forgeries, governments began to print stamp in multiple colors. The forger woul then be force to forge more than one plate. 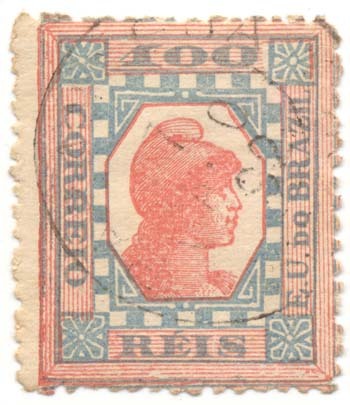 The 1891 100 Reis Brazil stamp shown below was printed using two plates. The introduction of multicolor stamps brought along the inevitable inverts that are famous rarities today. The majority of 19th century stamps are definitives (stamps issued to fulfill the payment of postal rates). Beginning in the 1890s, countries began to issue commemorative series. These often had high denomination values that would be purchased by collectors and would not be used in the mails. The sale of commemorative stamps soon became a major source of revenue for postal authorities, and this practice continues today. The railroad networks established during the 1890s contributed to larger mail volumes. It is during this decade that the super common first-class mail definitives are found; stamps like the United States 2c Washington Red, which were printed in the tens of billions.